Berlinica Blog: Advent, Advent — A Song You Can't Hear Often Enough! Advent, Advent — A Song You Can't Hear Often Enough! Advent, Advent! On this day in history — yes, it is still December 4 — Horst Buchholz was born in Berlin, in 1933. He became a beloved actor, dubbed "the German James Dean". In America, he is mostly known for "One, Two, Three," the Billy Wilder-movie and the ultimate Cold War parody. Sadly, the movie bombed at that time because when it came out, the Berlin Wall had just gone up. Just to cheer you up in these tough times, here is Horst Buchholz being interrogated by the Communists fighters against antifascism everybody remembers so fondly. 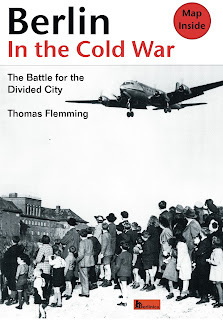 And, on a more serious note, here is out book on the Cold War! Welcome to our Advents Calendar!